Q: May I use this menu in Arabic mode I mean in right to left mode? If yes please let me know how? A: You're able to use any characters for Deluxe Menu in the same way asyou use them for standard html page. The only issue is that submenus can be shown in incorrect positionwhen you're using dir=rtl for your page. Unfortunately, you can't use arabic characters in Deluxe Tuner application.You should manually correct your code. A: Deluxe Menu doesn't save state as Deluxe Tree. - this is the only menu I am interested in as it has the capability of positioning the menu script relative to an existing table in the HTML coding of the page. I already have a vertical scrolling menu with several features visitors. We are moving our website to our own server and are doing some updating to make it more attractive when viewed at different resolutions. If you look at the source coding for the page (yes, it's almost exclusively in HTML - it usually views well on any browser) you will see that ALL the content is enclosed in a table which is centered on the page allowing it to be completely viewed at any resolution of 800 x 600 or greater. But the scripting I'm using ( /* Created by Randy Bennet...) uses the left margin of the browser window as left margin of the page. If it could be written so that the left margin of the existing (and centered in the browser window) table would be the point from which the left corner of the "object1" was measured, then the page would view nicely at any resolution. But I cannot find out how to do this from your "newer version". 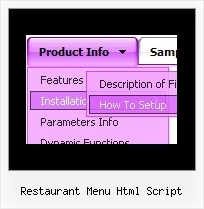 Creating a dynamically populated restaurant menu PHP. ... On the web page, you'd build a PHP script to run a query on the database to pull ... <html> <body> <h1> This is the featured item:</h1> <h2><?php echo $itemName; ? Collapsible Frame scripting... need help!